Paragraphs and Essays 12 Edition Now in its 12th Edition, this classic text offers comprehensive, proven instruction in developmental writing. 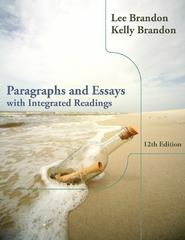 Paragraphs and Essays: With Integrated Readings is the higher-level companion to Sentences, Paragraphs, and Beyond in the bestselling two-book Brandon series. Instruction in this text--comprehensive, flexible, and relevant--is predicated on the idea that reading and writing are linked and that good writing is the product of thoughtful and systematic revision. The hallmarks of the Brandons' books are tell-show-engage instruction, ample demonstrations of good professional and student writing, and an abundance of reading-based, high-interest general, cross-curricular, and career-related topics and prompts. Reading-based writing provides experience in critical thinking that enables students to write with insightful substance across the disciplines and transition smoothly to the next level of the English program. The Brandons' long-term commitment to relentless revision and rigorous editing is further expanded in this edition by the launching of the Brandon Guide for Revising and Editing, an acronym-centered method that students can use as they first write and then apply for quality control before submitting assignments. The Brandon Guide, in turn, is supported by the also-new Top 25 Editing Errors, a unit dedicated to eradicating, or at least minimizing, repeated problems in mechanics that bedevil students and appropriate too much time from instructors who are evaluating assignments.